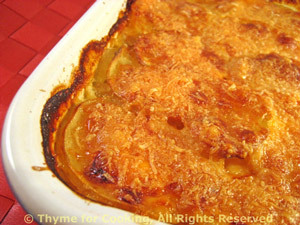 Potato Cheddar Gratin, slow food, a side dish from Thyme for cooking. Because this is baking in the same oven as the ham, it's baking at a lower temperature and will take longer. Don't worry, the results will be a wonderful, creamy gratin with tender potatoes. Add onion and sauté until just tender, about 7 minutes. Slice potatoes as thinly as possible with a sharp knife or mandolin. Put 1/3 sliced potatoes in bottom of baking dish - just big enough to hold everything ...I use my 9 X 12 inch (22 X 30cm) oval ceramic baking dish. Spread half of the onion over the potatoes, sprinkle with half of the flour. Drizzle 1/4 cup of milk over the top, then add 1/3 of the cheese, spreading evenly. Spread final layer of cheese. Pour remaining 1/2 cup milk or cream over all, cover and bake (325F, 165C) for 90 minutes. Uncover, sprinkle Parmesan over the top and bake for 15 minutes longer. Note: Whenever I am baking potatoes with a liquid: gratin, scalloped, Savoyard, etc. I always put the baking dish/dishes on a baking sheet covered in foil. They almost always bubble over and this saves on oven clean up. Just wrap up the mess and toss!